You'll be £4.99 closer to your next £10.00 credit when you purchase Fifteen Rounds a Minute. What's this? To many, the First World War conjures up exclusively a picture of trench warfare, in which the armies of both sides remained locked in the mud and despair of their static positions. The war of movement with which the conflict opened and closed is less well remembered. This book, originally published in 1976, is an attempt to correct that situation, by providing a detailed daily account of the actions of one of the finest of the battalions of the original British Expeditionary Force that crossed over to France in the summer of 1914, the 2nd Battalion Grenadier Guards – The Models. The story is told in the words of the officers of the Battalion, few of whom survived the war, taken from their diaries and letters, and covers all the major actions of the first five months of the War – Mons and the Retreat, the Marne, the Aisne, culminating in the dark and desperate days of First Ypres. By the end of that battle the Battalion had lost 959 men killed, wounded and missing – practically its entire strength. for the most part the story is told by Major 'Ma' Jeffreys, later General the Lord Jeffreys, whose diaries, supplemented on occasion by the diaries and letters of some of his brother officers and others, provide a very complete, graphic and deeply moving picture of those turbulent days as seen by an ordinary regimental officer of the old school. This publication provides a graphic and highly recommended picture of the turbulent days of the early fighting on the western front. 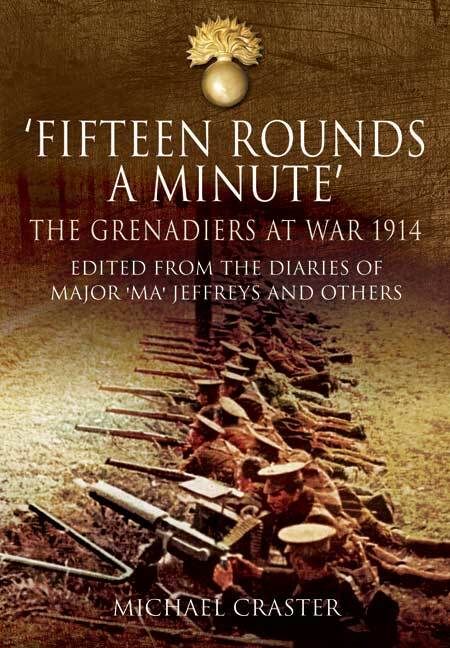 Full of humour, full of detail and, more especially, full of information, Fifteen Rounds a Minute is my kind of book. Originally published back in 1976, this is a most welcome and very engaging acvcount fo the 2nd Battalion Grenadier Guards who crossed to France in the summer of 1914. The account is told in the words of the officers of the battalion, taken from diaries and letters and makes excellent reading. By the end of First Ypres the battalion had lost 959 men, killed, wounded or missing. Highly Recommended. 10/10. Michael Craster is a retired British Army officer who served with the Argyll and Sutherland Highlanders in Aden and transferred to the Grenadier Guards on the reduction of the Argylls in 1971. He was latterly Defence Attaché in Vienna and Brussels.